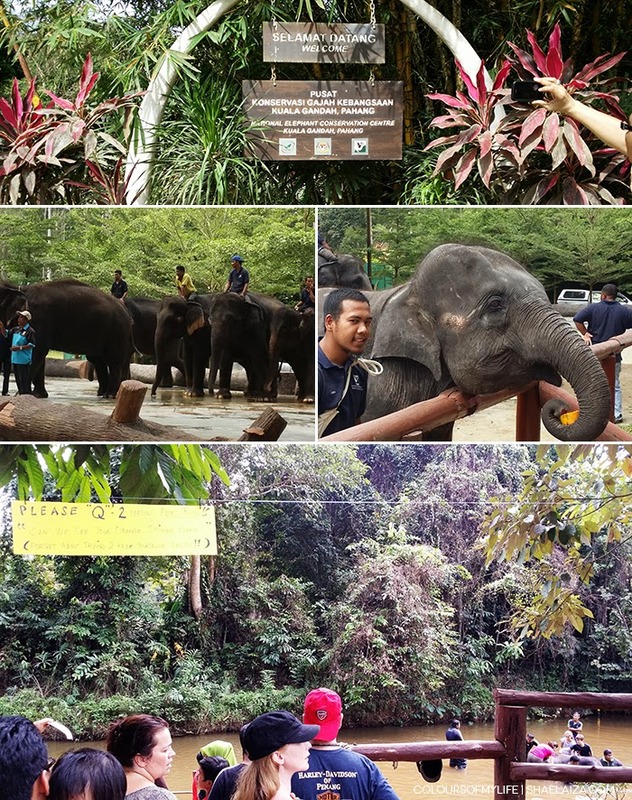 I first heard about Kuala Gandah Elephant Sanctuary from a friend who was visiting Malaysia for a holiday. Ever since then I promised myself I would go there someday. A place where I can hang out with rescued elephants? Yes sir, sign me up, please! I took advantage of the Chinese New Year holiday and coaxed my family to go with me yesterday. After almost 2 hours we arrived at the elephant sanctuary. It's situated in a remote village in Pahang and the drive was very scenic. If you like being surrounded by greenery you will enjoy the journey to Kuala Gandah. The yellow sign says: "Please queue 2 persons per row. Can we see your orange sticker please? Forget about trying to stay dry too!" There was a massive crowd at the elephant sanctuary. I guess lots of people wanted to take advantage of the Chinese New Year holiday like me. The staff told me they weren't expecting a turn out that big and the elephant bath activity was limited to only 100 people per day and they had already allowed 120 people to sign up. I felt sorry for all the tourists who came all the way specifically for that activity only to be told the daily quota had already been filled. After all, I was one of those tourists! Furthermore, I did call earlier in the week to register for the activity but they told me I didn't need to. During the elephant feeding session I spotted another staff member and used my "powers of persuasion" (my mother's great persuasive skills and my puppy dog sad face) to try and get me into the elephant bath activity. The guy felt bad for me, gave me a sticker and said, "Tell them you're my cousin or else they won't let you through." By the way, there is no entrance fee to the elephant sanctuary but donations are more than welcomed. 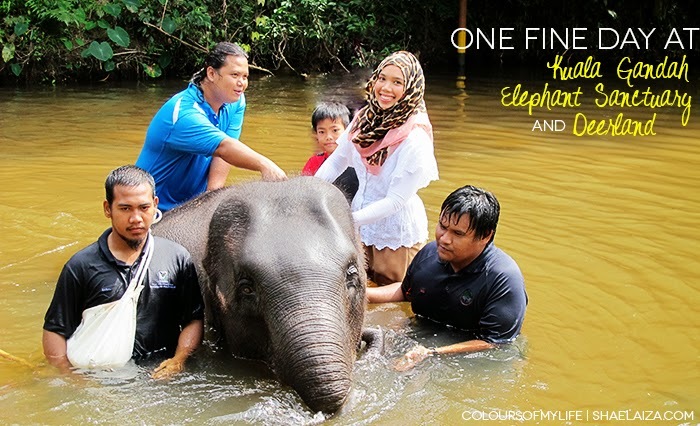 However, to participate in the elephant bathing activity it costs RM 10 per person. "Forget about trying to stay dry." You can say that again! Giving 5 year old Langsat a bath in the river was so much fun even though we only had about 10 minutes with her. I suppose if we had come on a different day we would have been able to spend more time with the elephants. They are magnificent creatures! Did you know if a female elephant were to die the other female elephants would take over the responsibility of looking after of her calves? Some people came prepared with bathing suits which I think is a great idea. Shower rooms and changing rooms are provided, if you're wondering. After cleaning up we dropped by Deerland Park. The entrance fee is RM 6 per adult and RM 3 per child. 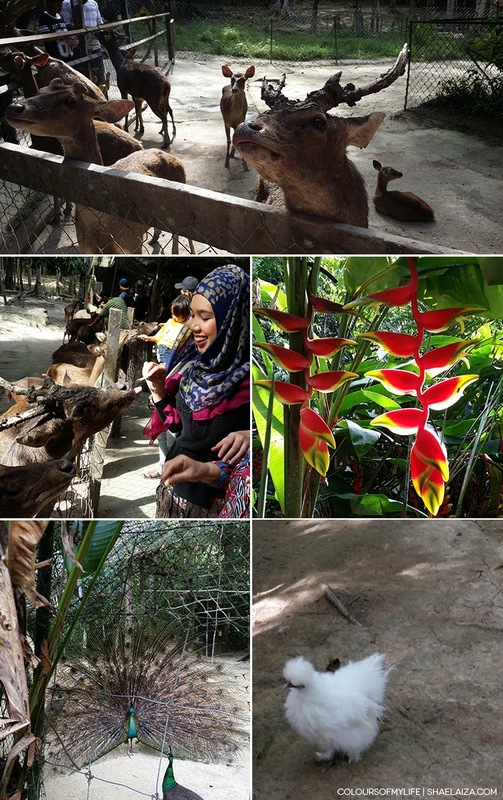 It's a deer park/farm but there are other animals in the compound too - ferrets, bengal cats, snakes, raccoon, rabbits, hedgehogs, (interesting looking) chickens and various types of birds. It's great for the young ones and the young at heart! The main activity is the deer feeding session. Overall, it was a good experience. I would totally visit the Kuala Gandah Elephant Sanctuary again. I recommend you to pay these two places a visit, especially if you have children. It's very important to teach kids to love and respect animals and the environment. I think instilling this virtue in children and young adults in one of the ways we can stop cruelty towards animals and create a sustainable way of life. Start them young!